Pinterest: Should I rePin across multiple group boards all at once or space them out? 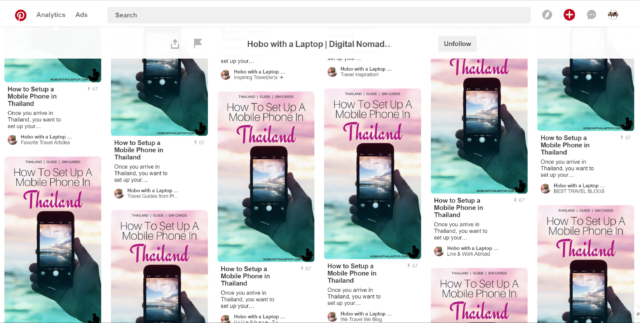 I see many Pinners repinning the same pin to multiple boards one after another in a row. The result is a cluster of the same pin on their profile, sometimes 30+ times in a row. See the screenshot below for example. That's my friend Mike's Pinterest so I don't think he'd mind that I use him as an example. I mentioned to him a few weeks ago how it looks and he's since stopped and is now scheduling his rePins to space the same graphic out across his account. But I don't want to steer him wrong (or myself). Since that convo with Mike, I've continued to see this practice on some “high profile” Pinterest accounts. Personally I use Tailwind, and when I have a new Pin to post to multiple boards, I schedule them and space it out to 1) keep my own content fresh in the mix, and 2) to avoid that cluster which I think is crappy to look at if I were browsing my profile as anther user. So my question is… Is one method better than the other? I'm assuming people cluster like this for momentum. “24 repins within 1 hour”. But if it's all repinned by themselves, does it algorithmically have any advantage? After failed Google searches, I posed this question to the Simple Pin Pinterest Strategy Group on Facebook to see if anyone had experience that could provide a definitive answer. I got some speculation and anecdotal stories, but nothing that swayed me in one direction or another. Looks better on your profile if a visitor was scrolling through your Pin Tab. No-one wants to scroll past the same pin 30 times in a row. “No-one looks at your profile anyway. They typically view Pins in their feed or via search.” — said one person in the group. However, I look at people's profiles, and the cluster-Pin approach is something I've noticed (enough to inquire about it). So doesn't that mean other people must look at profiles too? For now, unless I learn definitively otherwise why I should cluster, I'm going to continue with my method of spacing out my rePins across multiple boards over the course of 10-14 days, for the reasons I mentioned above. However, I may split test the “cluster method” to see if there is a noticeable difference in the subsequent rePins and traffic derived from the original pin. There are so many variables at play like the content of the pin, the pin graphic itself, the time of day, the day of week, the fact that I'm also submitting my Pins to various Tailwind Tribes, etc. So even if I split test the spaced out method versus the cluster method, there would have to be a SUBSTANTIAL difference in number of impressions/clicks for me to attribute the added pin success to the cluster method. That's why I was Google searching and reaching out to other Pinners to see what their results have been. Hey Paul, your first subheader reads “Reasons for spacing our the repins” did you mean “out” instead of “our”? Hello, I find myself wondering the exact same question, and would like to know if you made any discoveries doing testing, whether the cluster pinning does have an effect on impressions or whether spacing for optimal profile aesthetic is the best option?